The Xiaomi Mi 5 is the manufacturer's current flagship phone. Powered by the Snapdragon 820 chipset, the standard version of the device comes with the Adreno 530 GPU and offers 3GB of RAM. For those who needs more speed, Chinese online retailer GOME is offering what is being called the Xiaomi Mi 5 Extreme version. For starters, the CPU is overclocked by 19% to 2.15GHz from the 1.8GHz clock speed on the regular model. The Adreno 530 GPU runs at 624MHz, a 22% bump from the usual 510MHz, and the 3GB of LPDDR4 RAM is now measured at 1866MHz. That is a 40% boost from the 1333MHz speed found on the regular Mi 5. Keep in mind that the same 3000mAh battery is employed, which means that battery life will be negatively affected. The phone is available in four colors, White, Black, Gold and Purple. The price is the equivalent of $298.50 USD except for the black model, which is priced slightly higher at $306 USD. 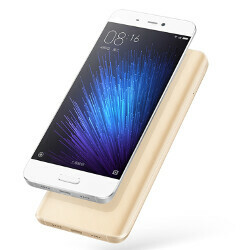 If interested in a slightly more powerful Xiaomi Mi 5, click on the sourcelink. There are 2 versions of mi5( the regular and pro version). Regular version uses lower binned 820 and the pro version uses regular 820. The pro version is only available in China and comes with a ceramic back and 128GB storage. How else do you think QC is getting rid of the bad 820s. Crap, I misunderstood the pro for the 8996 as the pro of mi5. Meh, all brains-brawn and not enough supplies! I've had it. Xiaomi killed my interest with Mi5 (ceramic) unavailability in my area. Sites like ibuygou are really quite good. They just charge a bit more to make profit nothing wrong with that. I wish you could actually use it in the US. Mi 5 was their first real flagship. I hope they will do better next year. They are really promising. I wish they enter US market sooner. It will be better for them. And by what percentage is the battery life reduced? I've overclocked processor, ram and graphics card on my pc and that sometimes comes at a significant increase in power draw. However i only do that when i really need to as the performance increase does not scale equally with the overclocked. A 30% overclock might give only a 5-10% performance boost. It's not overclocked, this article is about nothing. 64GB version of Mi5 always had SD820 at full speed which means 2,15GHz. Only the 32GB version had downclocked version (to 1,8GHz) and it still has. Dear Alan F. This Mi 5 "Extreme Edition" you are talking about, it already exists. Go to GSMArena and look at the specs of Xiaomi Mi 5 64 GB edition. Isn't this just the normal higher end mi5 that's been on sale for months. It came in two tiers 32gb with an underclocked 820 and 64gb/128gb with the regular one. Hahaha, 5% improvement hype Only. Check your facts PhoneArena. The "high-end" (2.15GHz + 3GB) and "prime" (2.15GHz + 4GB) versions are on sale at launch, just not as available as the regular one.